The Vanson RACE TEAM JACKET features a full-cut leather body with wool knit collar, cuffs and waistband, sports racing sponsor patches, and an embroidered Vanson oval logo on the front and left sleeve. It’s made from beefy competition-weight cowhide, black on the front and back with red leather sleeves and pocket trim, two hand pockets, two inside pockets, a comfortable rayon lining, and a solid brass front-close zipper. Our RACE TEAM JACKET is also set up to receive the insulated, reversible Vanson Streamliner with its removable sleeves and lace-adjustable sides. 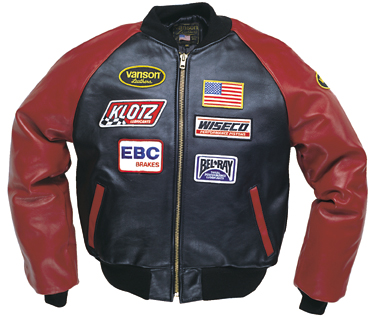 For a great look with great comfort imagine yourself wearing a Vanson RACE TEAM JACKET.